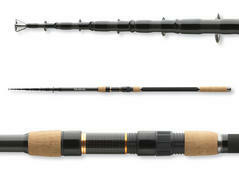 The Megaforce telescopic rods now feature a reworked design, improved components and additional models. The rods with lengths of 1.80m to 3.00m and casting weights of 7-25g to 70-150g are now available at a very short closed length of only 69cm – perfect, when the rod is transported in a backpack or travel bag. The models with 3.30m length and above feature a somewhat longer closed length and display actions, which resemble the bending curves of detachable rods. 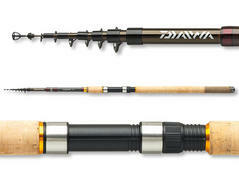 These delicate rods have been particularly designed for fishing in trout ponds with sbirolino and bombarda. 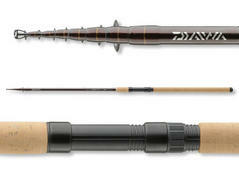 The slim blank is very well balanced and combines an incredible casting performance with high sensitivity and an astonishing bite detection. 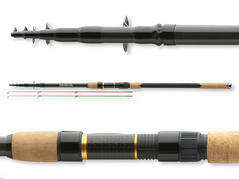 The backbone offers high power reserves for the cast and fight with the fish. 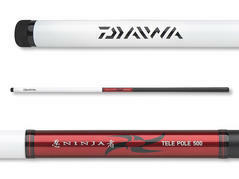 With the Ninja X tele rods DAIWA offers a broad range of universally applicable telescopic rods. The rods of the Ninja X series offer a perfect action, which resembles the action of detachable rods and is based on premium carbon fiber blanks and tread-wrapped guides. 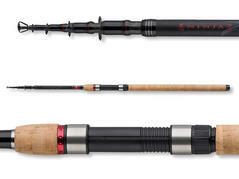 These rods enable the application of shads, plugs and Co. by providing much sensitivity and lure control in a way, which makes it hard to distinguish them from detachable rods. The Aqualite series also includes two telescopic models with 3.90m, 4.50m and 5.10m. These semi-parabolic rods are ideally suited for fishing for tench, bream, trout and perch with the float – the soft tip enables long casts and excellently absorbs all flights. Both long versions additionally is highly recommended for fishing for coregones with the float when long rigs are used in the middle water. 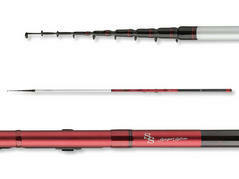 These telescopic carp rods feature a thin and well-balanced blank, which easily casts weights between 60g and 100g to great distances and shows enormous power reserves during the fight. 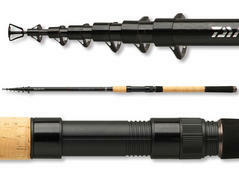 This telescopic feeder rod features a strong blank and provides much pleasure during the fight thanks to its continuous action. 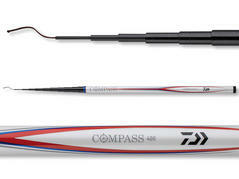 This rod is excelled by its design as well as its favorable action and can also be applied as method feeder or even at fishing for eel. Equipped with titanium-oxide double leg guides, split cork handle and cloth bag. 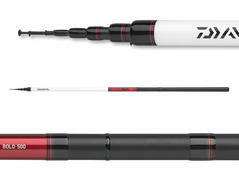 With the Procaster Tele rods DAIWA adds five excellent telescopic rods to a successful rod series. The lightweight and perfectly balanced blanks feature a fast action with good resilience. The bending curve under strain resembles the one of detachable rods and ensures safe and sensitive fights with large or fierce specimen.